A power ranking of all 32 NFL teams after week two play. The Seattle Seahawks once again beat down the 49ers in Seattle, to move into the top spot this week. It could be a different story when they meet in S.F. later, but for now, the Seahawks have an early lead to win the NFC West. After losing 24-20 to the Dolphins, the Colts tumble out of the top 12 teams and are replaced by the 2-0 Dolphins. The Lions fall out of the top 12 after losing to the Cardinals and are replaced by the Saints who are 2-0 in the NFC South. And the Cowboys stay at 12 after losing to the Chiefs 17-16. Allow me to explain, in my rankings I have at least one team from every division because eventually some team will win that division and make the playoffs. Currently none of the NFC East teams deserve to be in the top 12. The Redskins and Giants are a dismal 0-2 and only 12% of teams starting 0-2 make the playoffs. That leaves either the Eagles and Cowboys who are very close on paper with a 1-1 overall record, both 1-0 in the division, and their only loss being out of conference. I gave Dallas a slight edge over the Eagles for losing on the road to the 2-0 Chiefs while the Eagles lost at home to the 1-1 Chargers. Dallas should be ranked about 16 but at the moment, they have as good of a chance to win the NFC “LEast” as anyone. These 6 Playoff Teams Can’t Afford an 0-2 Start. The following 6 NFL teams made the playoffs last season but lost their first game last week and now face the sobering possibility of starting the season 0-2. Bengals, Falcons, Packers, Ravens, Redskins, and Vikings. Is it a bad omen to start a season 0-2? History would indicate that yes, starting a season 0-2 usually doesn’t lead to a good season. In the past only 12% of teams who start 0-2, go on to make the playoffs. Last season all 6 teams that got off to an 0-2 start finished the season with losing records and consequently, no playoffs. The teams were Browns, Chiefs, Jaguars, Raiders, Saints, and Titans. And in 2011, 7 NFL teams started 0-2 and all 7 finished with losing records. That makes a total of 13 teams the last two seasons that could not over come an 0-2 start to have a winning season. A look at the games these 0-1 teams play this week as they try to become a more optimistic 1-1. Redskins @ Packers– Without question, one of these two 0-1 teams are going to come out of this game 0-2. The Packers played well but lost on the road to a very good 49er team while the Redskins lost a home game to the fast paced Eagles. In that game, the Redskins started terribly on offense but finished the game better as RG3 warmed up. They had a chance to win had they recovered an onside kick. I like the Packers chances of getting a needed win at home and avoid going 0-2. Vikings @ Bears– The Vikings are a QB away from being a solid contender but they lost in Detroit last week. Now they have to go play in Chicago which is no easy place to pick up a win. Peterson will do his thing but can the Vikings come up with enough of a passing game? Steelers @ Bengals– If the Bengals want to improve their record to 1-1, playing the Steelers now may just be the answer. After the Steelers played poorly on offense losing to the Titans, they now have lost their center. I like the Bengals chances to avoid an 0-2 start. Rams @ Falcons– The Falcons are almost unbeatable in the Georgia Dome. And after losing to the Saints last week, I can’t see any way they lose this one. The Falcons will avoid an 0-2 start and look for Jackson to make the Rams wish they never let him leave. Browns @ Ravens– The defending super bowl champs got a rude congratulations in Denver last week as Manning threw a sick 7 TDs against them. I feel the Ravens are not the same team as last year but they are at home and it is the Browns. The Ravens will avoid an 0-2 start. So which teams will fall into the 0-2 abyss next week and spend the rest of the season trying to climb out? I think the Redskins are looking at a serious possibility as they try to find their offensive mojo in Green Bay. Also the Vikings face a serious challenge in playing the Bears in Chicago. In my view, the other 4 teams will avoid that formidable 0-2 start. NFL POWER RANKINGS WEEK 10: Seahawks and Colts power their way into top 12. All 32 NFL teams ranked after week 9. Previous week. SEAHAWKS: The Seahawks defeated the Vikings to power their way into the top 12 at #11. That second wildcard spot in the NFC is very much up for grabs and the spot could change weekly from now until week 16. But for now the Seahawks appear to be the team worthy of the spot. COLTS: Led by rookie QB Andrew Luck, the Colts defeated the Dolphins to move up to the #12 spot. Right now the Colts are actually in a position to claim an AFC wildcard spot. Of course a lot of football remains to be played. GIANTS: The Giants lost at home to the Steelers and moved down 2 spots. The Giants still look like the best team in the NFC East. NFL Power Rankings WEEK 9: Dolphins No Shame in Their Game. All 32 NFL teams ranked after week 8. Previous week. No movement in the top 8 teams as they are holding their spots at the top. Dolphins Stepping UP: The Dolphins now have a winning record (4-3) after beating down their division rival Jets. I moved the Dolphins up 5 spots into the top 12 as they are a team that is on a roll currently. Rookie QB Tannehill has improved and looks like a solid NFL QB. The Dolphins replace the Chargers in my top 12 as they lost to the Browns who had only one win coming into the game. The Chargers appear ready to fold up like they do every year. The Chargers tumble down 10 spots to #21. WEEK 9 2012 0 = no change. All 32 NFL teams ranked after week 6. Previous week. For the past 3 weeks, I have had the Falcons ranked at the top while almost all other rankings have had the Texans. Sunday night Packer QB Rodgers carved up the Texans defense and handed them their first defeat. The schedule doesn’t get easier for the Texans coming up either. The Falcons have enjoyed a soft schedule so far but their schedule will get tougher too but for now, they are on top. While I had the Falcons at the top, I have always believed that the 49ers actually may be the best team in the NFC but the Giants came into SF and put a beat down on the 49ers. That showed us that while the 49ers are a very good team, they have to show up every week. I thought rematches were made for the losing team to get revenge but the Giants were having none of that. This game is the first where the Giants looked like the super bowl champ Giants to me. Moved them up into the top 5 teams this week. With Dallas and The Eagles losing, the Giants have moved to the top of the NFC East. Yes I moved the Jets into the top 12 and I couldn’t believe I was doing it either. Remember I put the best 6 teams in each conference in the top 12 and with the 3-3 Patriots losing at Seattle, the Jets and Dolphins (both 3-3 records) are now very much in the hunt of the AFC East title. The Bengals and Steelers both lost which opens the door for the Jets and Dolphins as AFC wildcard contenders. All 32 NFL teams ranked after week 3. Previous weeks rankings. 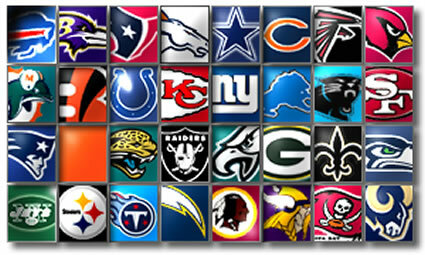 Most reliable and accurate NFL team Ranking: That would be this one. Last week all the “experts” had the Eagles ranked ahead of the Cardinals but this blog had the Cards at #8 and the Eagles #9. After the Cardinals convincing 27-6 victory, I would say I had it right. New Leader: The mighty 49ers fell into a trap game in Minnesota and lost their first game while the Falcons went to San Diego and beat the undefeated Chargers with ease. At 3-0 the Falcons assume the top position for now. Interesting that all three Falcon wins have come against AFC teams so far. The Texans at #2 are also 3-0 and look very good but have benefited from a fairly soft schedule so far. The 49ers fall to #4 behind the undefeated Cardinals who are also 1-0 in the NFC West division. New Bottom: I had the Chiefs at the bottom last week but they won in OT at New Orleans keeping the Saints winless. So the Saints must settle in at the bottom since the Chiefs found a defense worse than theirs. Biggest Bounce Up: The Vikings moved up 11 spots to #18 after upsetting the top ranked 49ers. The Vikings are 2-1 and Petterson seems healthy. Dropping like a challenge flag with replacement refs: The biggest drop was for the miserable and winless Saints. They fall 10 spots to 32. If you think they don’t deserve that spot, I agree but there are only 32 teams and I can’t put them at 33 or I would. I was convinced that the Chiefs were the worst team in the NFL but when they won at the Saints, what choice did I have? Good hand of Cards. The Cardinals are 3-0 and look like they are for real. I have them at #3. Brady & Bunch losing record. The Patriots are 1-2. I have them ranked in the top 12 because I think they still will win their division. Cheese Heads losing record. The Packers are 1-2. The Ain’ts. Saints 0-3 is a big surprise. Didn’t realize their head coach meant so much to them. WOW. Ranking of all 32 NFL teams after week one.